The August & Wonder app was approved and is now live in the Apple App store! 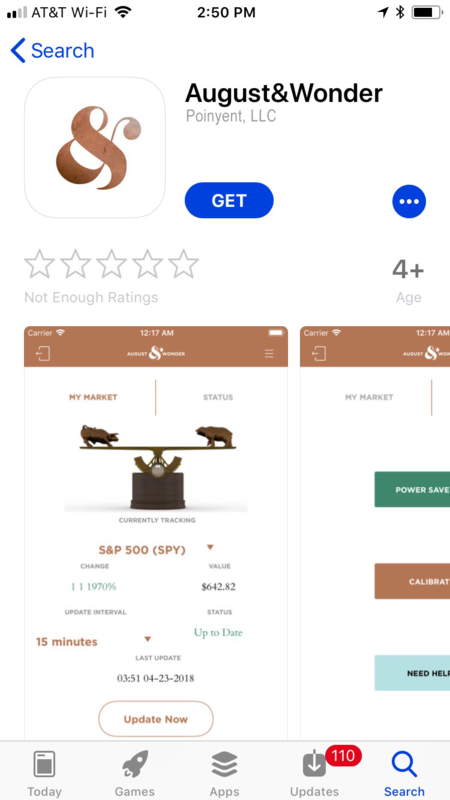 We have created iOS and Android apps that enable owners of The Market to easily set it up on WIFI and to set which index or cryptocurrency the Market will track, as well as how often it updates. In addition, the app will provide tools to calibrate The Market so it will always be accurate. The Android app will on the Google Play store in the next week. The Market consists of over 20 parts, and each week more parts arrive. 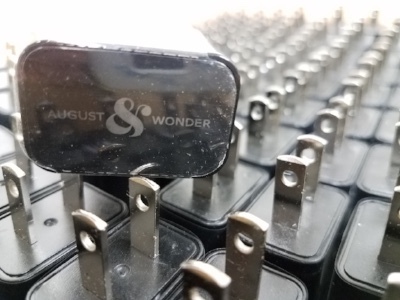 Pictured here is the USB charger plug, with the August t& Wonder logo inscribed on it. Other parts arriving have been light rings, magnifying lenses, USB cables (etched with the August & Wonder ampersand), as well as fastenings, plates and screws. In addition to the above items, we've been finalizing firmware and systems to be able update the firmware remotely if needed. Motors, wood bases and electronics are all in production and should be arriving within the next two weeks. The major outstanding items are the final cast parts and the packaging. We expect those to be ready in the second half of the month. Once everything comes in, we'll be able to start assembling, testing and shipping . A this point, we still estimate to start shipping the first Markets at the end of August. In the mean time, there's a window of opportunity to get The Market Series A at the pre-order price of $495 plug-in/$525 cordless. But that window is closing on August 17th where upon the price will jump to $990/$1150. If you haven't already, put in your Pre-Order today.